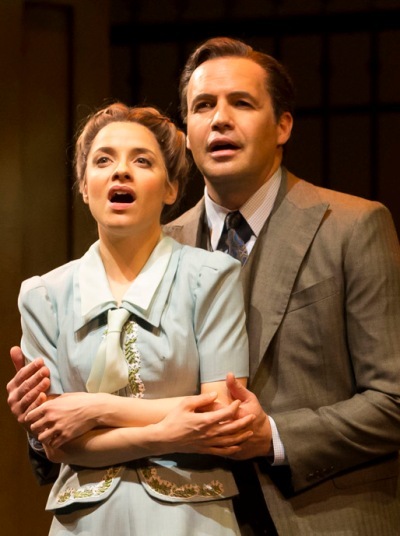 There’s nothing like practice to turn an opera company into a viable musical theater producer, as the Lyric Opera of Chicago’s third venture into Broadway’s golden oldies clearly shows. 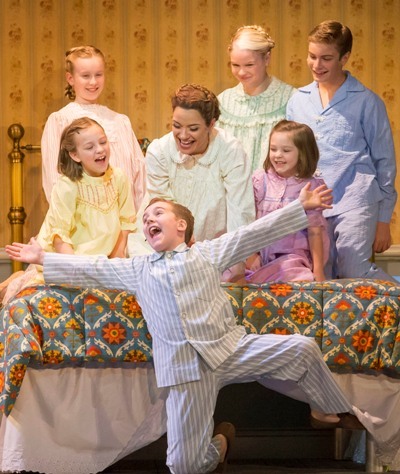 “The Sound of Music” is the Lyric’s best effort in the classic musical genre to date, after “Showboat” in 2012 and “Oklahoma!” in 2013. Director Marc Bruni and conductor Rob Fisher, playing to a crowd of all ages, have salted this Rodgers and Hammerstein fairy-tale romance based on historical fact with sly wit and solid musical values. 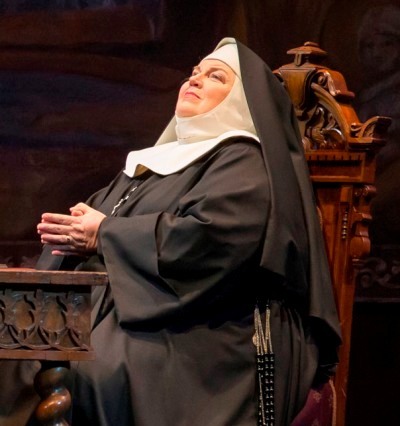 The nuns’ choruses, led by dramatic soprano Christine Brewer as the Mother Abbess, resounded as in a cathedral. The orchestra had lushness only strings can give. Scene shifts were presto change-o and flowed as smoothly as the seven von Trapp children on their sized-right shiny green bikes. And the rivalry was delicious between coloratura soprano Elizabeth Futral, as the elegantly droll baroness who has all but cinched her marriage deal with Captain von Trapp, and Broadway gamin Jenn Gambatese, as the rambunctious would-be nun Maria who falls in love with von Trapp’s children first, and then with him, as Nazi Germany’s annexation of Austria begins. Futral has sung Violetta in “La traviata” in the world’s opera houses, and her baroness moved with the studied grace of one who is accustomed to having all eyes on her in the room. She draped herself across the lavish Michael Yeargan-designed Salzburg estate and grounds, not to mention Billy Zane’s Captain von Trapp, as if they were already her own. This soprano is also a bitingly clever actor, one who knows how to fling a casual aside to the back of the house. 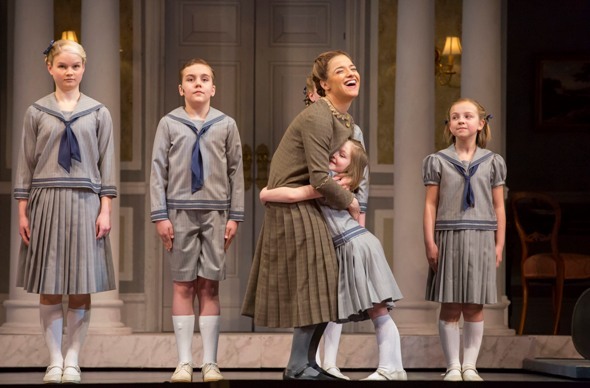 Against all this, sweet-voiced Gambatese conveyed the earnest sincerity of a young woman who loves everything about von Trapp, including his ideals, and the musical took on a surprising extra layer of richness that adults in the audience are likely to find rewarding. Gambatese was also a lot of fun, and quite acrobatic, as ready to connect with the children in the audience as she did with the von Trapp clan. It would have been kinder if designer Yeargan had surrounded Gambatese with a substantial bit of green as she sang her “hills are alive” title number at the top of the show. The mountains were present, but distant, in the backdrop, and thus Gambatese was left to summon the dizzying sense of freedom Maria feels on the mountain by her vocal art alone. 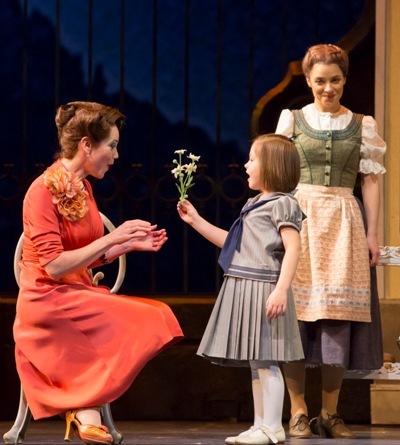 From the time Maria presented herself at the gate of the lively von Trapp household, guitar in hand, the show felt on firmer ground. 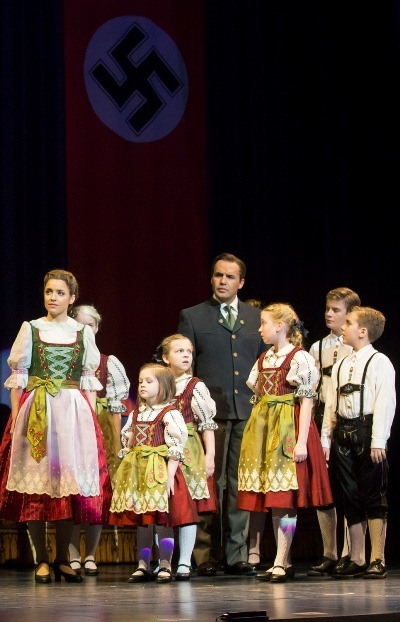 The “So Long, Farewell” song, which effected the family’s getaway from hovering German forces, was prolonged by a drama set in motion as Captain von Trapp sang “Edelweiss” in memory of an Austria that was disappearing for him. Zane, the lone actor among the principals without a trained singing voice, seemed a casting question mark early on, but the wisdom of that choice became apparent with the increasing isolation of the Captain’s political stance, which stripped von Trapp of his options and left him as more or less an everyman, whose brave, plaintive song rose to pure poetry. 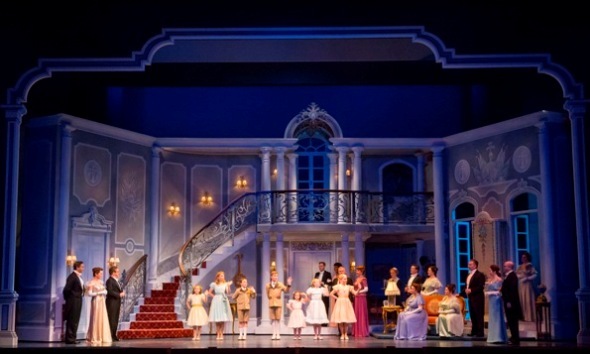 It’s a mistake to assume that an opera company like the Lyric – which has produced flat-out hilarity with its wily “Barber of Seville” and hair-raising thrills with its eerie “Elektra” – doesn’t know about comedy, tragedy and suspense. Nevertheless, an acoustical arena like the Civic Opera House, which is more than twice the size of most Broadway theaters, poses an enormous challenge for dialogue-rich shows. The mixing of opera-trained and theater-trained voices seems to be working. 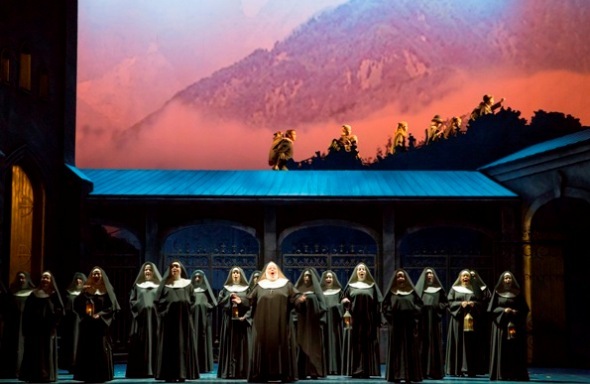 What musical theater buff wouldn’t have responded to Brewer’s admonishment to “Climb Every Mountain,” sung as it was by a full-throated Wagnerian who set the entire inside of the Opera House aquiver as if it were a Strad? Meanwhile, the amplified sound in the house, so necessary for the dialogue and smaller voices, is improving, if still short of consistent for all performers and still variable in crispness depending upon the seating area. The Lyric is performing impressively on its musical theater learning curve, and all bodes well for next year’s spring show — “Carousel” starring Denyce Graves — the third of five consecutive Rodgers and Hammerstein properties for which the Lyric has secured rights. “The King and I” and “South Pacific” will follow.